Overall experience was very good. 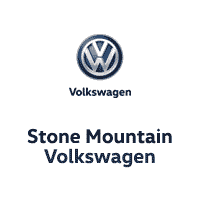 I would definitely recommend Stone Mountain Volkswagen to friends and family. The leasing process was simple and did not take very long. Tony was so attentive, informative and patient. It was literally the best car buying experience I've ever had. Tony chose the perfect car based on my request and price point. He explained all the features of the car in details to ensure that I understood how to operate everything. Rick also an excellent job on the financial end explaining all the many pieces of paperwork that needed to be signed to complete the sale. I felt like they were both old friends. Both were professional and personable. Would definitely recommend the dealership to friends or family. I'm in love with my car. The service team are nice workers. They’re courtesy and did the job well. The wait time was long but it comes with it. Chris was great answered all our questions and fixed an additional piece in our car at no charge. Sam and the rest of the team are extremely friendly. From my call to make a reservation to walking out the door, I was pleased with the service and communication I received. Everyone was friendly. I was greeted, offered a drink and was told to ask any questions. My service guy was upfront and informative when answering my questions. I worked with Carlos and had an excellent experience from start to finish. This is my first Volkswagen purchase and it won't be my last. Customer service is A+. 2019: Five years later, we are still avid Volkswagen owners and lovers of their product. Recently, my 2017 convertible Beetle needed a few warranty repairs. Rick helped me make sure that I was taken care of, and my car returned fixed, cleaned, and ready to roll. I really appreciate his help as well as the master technician’s help in repairing my window and seat issues. Thank you Stone Mountain Volkswagen. 2014: Phillip provided us with the most outstanding service we have experienced in a long time. He was friendly, knowledgeable, and willing to work with us on our purchase. This is the third vehicle we have acquired from Stone Mountain Volkswagen, and we would encourage others to seek their service when considering to purchase a new car. Thank you for your great work!